If you’re umemployed and in danger of losing your home, you may be eligible for up to $20,000 in loans through the Kentucky Unemployment Bridge Program (UPB). To be eligible, the homeowner must have experienced a job loss or reduction in income due to changing economic conditions, through no fault of their own and demonstrate a need for assistance. In order to assist Grant County homeowners facing foreclosure, the Brighton Center will sponsor a workshop from 12:30 to 2 p.m. on April 19 at the Grant County Public Library in Williamstown. The Grant County Chamber of Commerce will host its 41st annual banquet on April 30 at Williamstown High School. Representatives from the ARK Encounter will be the honored guests. Social hour begins at 5:30 p.m. followed by dinner at 7 p.m. The chamber’s annual awards for Volunteer of the Year, Grant Countian of the Year, as well as for Excellence in Education and Excellence in Business will also be presented. Kentucky residents who wish to vote in the upcoming May 17 primary election - which nominates candidates for major state government offices - have until Monday, April 18 to register to vote. Grant County Clerk Leatha Conrad will accept voter registration cards until 4 p.m.. A postmark of Monday or before is also required for all mailed voter registration applications. Registration cards can be obtained online at www.vote.ky.gov/register. Voters who have recently moved nbeeed to update their voter registration so that they are alloved to vote on election day. Kathyrn Howell of Dry Ridge already had a new puppy. Boy, was she surprised when her granddaughter saw a black vehicle shove two Golden Retrievers and a small Chihuahua/terrior mix house dog out and drive away in front of her home on Cason Lane. 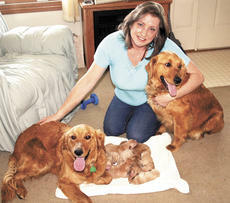 She was even more surprised when one of the retrievers gave birth to 10 small, fuzzy babies – a litter of all girl puppies. Howell was only able to save eight of the puppies. If you’ve got a bunch of old tires, car batteries and fluorescent light bulbs lying around your home and don’t know where to dispose of them, you’re in luck. The Grant County Solid Waste Management District is sponsoring a free tire disposal from 9 a.m. to 3 p.m. on April 14, April 15 and April 16 at the state road department on U.S. 25, south of Williamstown. This program is part of the Kentucky Tire Amnesty Program, which is held every three to four years in all Kentucky counties. In the 1960s, tattooing was considered anti-social, but by the 1990s it was a trendy fashion statement. Today tattoos on rock stars, professional sports figures and even Christian rock musicians are commonplace. Daryl Anness has had a broad spectrum of careers, from welder to certified nurse’s assistant, but none more colorful than his current one as proprietor of Jadloc Tattooing. The Grant County High School Future Farmers of America will hold a banquet for members and their families at 6 p.m. April 20 in the high school auditorium. Dinner will be provided by Buetels. New officers will be installed. Students are free and nonmembers will cost $3. Reservations and payment must be received by Richard Gater, the agriculture teacher, by April 12. Gerry Abramson, who is running for Lieutenant Governor, on the Steve Beshear ticket, will be meeting with Grant County residents at 2 p.m. on April 12 at the Dry Ridge Toyota Community Room. The direction of the Grant County Tourist and Convention Commission is up in the air after a proposed agreement with the Industrial Development Authority to handle administrative duties fell through. The commission voted unanimously during its Feb. 16 meeting to dissolve the position of executive director effective March 1 and contract administrative services with the IDA. The move would save the tourism commission a little more than $10,000 per year, according to commission member Randy Slayback, who made the motion to dissolve the position. Thomas Leach has raised tobacco since he was 12 years old. But, the 41-year-old Dry Ridge resident said last year’s crop was his last. Leach and Larry O’Neill of Dry Ridge have joined farmers Jerry Feagan and Steve Lang of Cynthiana in a breach of contract class-action lawsuit against a tobacco company. The Northern Kentucky and Cincinnati law firm of Strauss & Troy filed the lawsuit in Harrison County on behalf of a number of Kentucky tobacco farmers against Universal Corporation, also known as Universal Leaf North America (ULNA).